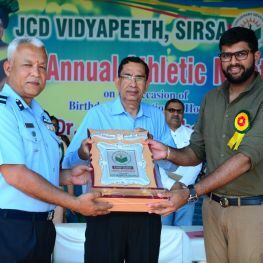 Sirsa 12 March 2018: On the occasion of the birth anniversary of Dr. Ajay Singh Chautala in JCD University, the 14th Annual Sports Competition was officially launched on Monday, in which Chief Commissioner of Sirsa Air Force Station, Mehtab Singh Deswal attended. On this occasion, Mr. Jagdish Singh Chautala, Chairman of JCD University, attended as a special guest and the program was presided over by JCD University’s Academic Director Dr. R.R. Made by Malik On this occasion, Principal of various colleges of JCD University, Dr. Pradeep Sharma Snehi, Dr. Vinay Lathar, Dr. Jay Prakash, Eng. R S. Brar, Dr. Dinesh Kumar Gupta, Mrs. Harleen Kaur besides other officials and dignitaries were also present. 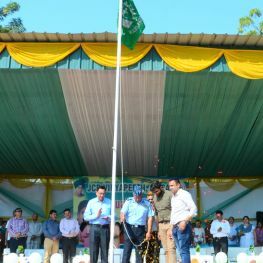 The program was inaugurated by the students through March Past and the inauguration of the sports competition was flagged off by the Chief Minister. In his first address, Dr. R.R. Malik told about the many achievements achieved by the students while presenting the report of JCD University. He said that our objective is the all-round development of our students, in which such programs play an important role. While providing information about the Chief Minister on this occasion, he said that due to the good work was done by Mr. Deswal, the Air Force Medal has been awarded, while all the students were also acquainted. Dr. Malik said that it is a matter of great pride for all those present that the students have the opportunity to showcase their sports talents at the occasion of the birth anniversary of Dr. Ajay Singh Chautala ji. He expressed his gratitude to Mr. Deswal for taking the time out of his precious time. 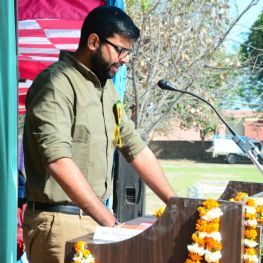 In his address as a special guest, Mr. Digvijay Singh Chautala, first of all, thanked Mr. Deswal on this occasion and thanked the students for making fun of them. He said that the Jananayak Chau Dr. Ajay Singh Chautala ji has done a better job in society, by giving a realization of the self that had been seen to make backward classes of students in backward areas in education like Sirsa. He said that this institution has been associated with the brothers with Air Force, which is executed from time to time on both sides. Shri Chautala said that we are proud of our students who are illuminating the name of the institute through their best presentation in different arts. He called upon all the youth that if they are sporting, cultural or talk about patriotism, then work with honesty and conscientiousness and try to fulfill their responsibilities. In his address, Mr. Mehtab Singh Deswal, in his address, firstly thanked the management committee of the Institute on this occasion and thanked him for saying that it is necessary for both the youth to be both passion and conscious, because this is the reason for the prosperity of the country. May move forward. He said that every person must adopt some sport in his life so that he can be healthy while holding a concentrated and impulsive behavior. He said that if you will continue to play, you will play only after your childhood till old age. 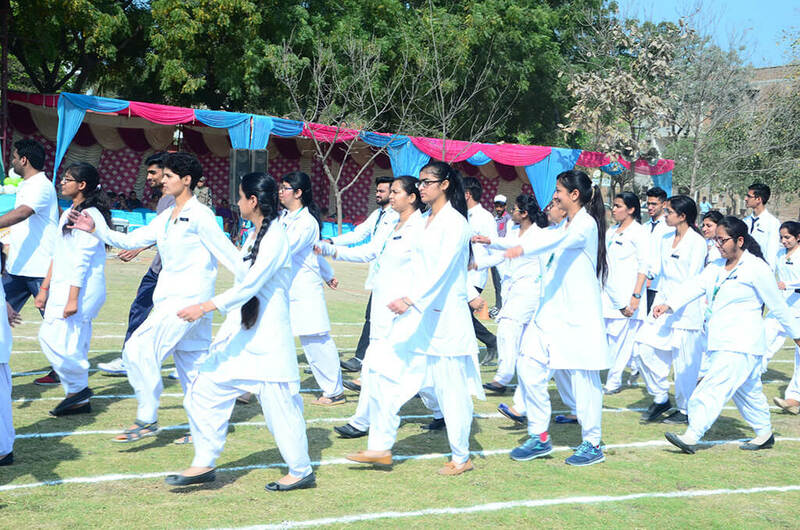 Students should take part in sports and other activities in order to keep themselves fit with good education and achieve success.